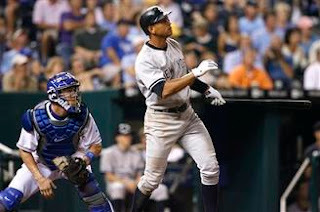 Alex Rodriguez hit career home run number 499 last night to power the Yankees to a 7-1 victory and their 6th straight. Today he will have a chance to hit number 500 as the team goes for a sweep of the Royals. What is interesting about today’s game is he is going to face-off against Kansas City pitcher Jorge De La Rosa who served up Arod’s 400th homer a little over two years ago. "It's a crazy thing," Alex said to the AP about the possibility of hitting number 400 and 500 against the same pitcher. "It's pretty unbelievable that it could actually work out that way." Understandably De La Rosa may be worried about being on the wrong side of history. "I'm going to pitch him very carefully," De La Rosa told the AP. These days most of the national media is focused on Barry Bond’s pursuit of Hank Aaron’s record, but it may be Arod’s feat which is truly remarkable. At the age of 32 Alex is about 5 years younger than Bonds was when he reached the career milestone. If Rodriguez plays until Barry’s age 43 than he only has to average about 23 home runs a year to tie Aaron. His pace so far during his career is about 38 homers a year and if he continues at that rate he would shatter any mark Bonds may set. For more New York sports go to Hot Stove NY.